The electrical fire in Vista that destroyed a home. 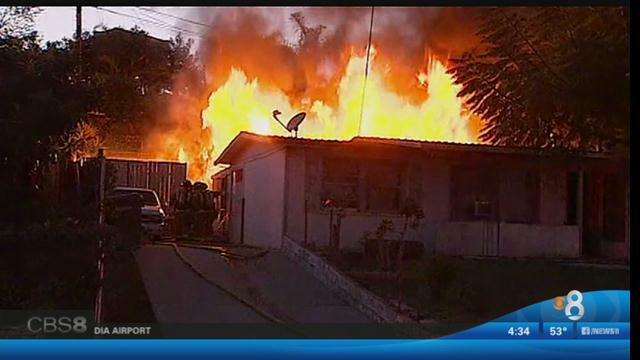 Courtesy of CBS 8. An electrical fire destroyed a Vista residence, downed power lines and left two people in temporary housing Friday, but no one was injured. The fire at the home on Onley Drive near Tatum Street was reported shortly before 6 p.m. Thursday, according to Deputy Fire Chief Ned Vander Pol of the Vista Fire Department. It started in a garage illegally being used as a residence, according to CBS8. Crews from Vista and Oceanside contained the blaze to the structure in which it started, but live power lines burned through and fell to the ground, Vander Pol said. The fire was fully extinguished by 6:35 p.m., the deputy chief said. The structure was a complete loss and the American Red Cross was summoned to assist the two displaced residents. Vander Pol estimated the damage at about $50,000. Sheriff’s deputies ticketed two parked vehicles blocking a fire hydrant, Vander Pol said.